Greater detail increases accuracy when interpreting ECG tracings. Data from your patient’s cardiac monitor populates a unique and proprietary CAM™ report that enables you to confidently identify specific arrhythmia to aid clinical decision-making. 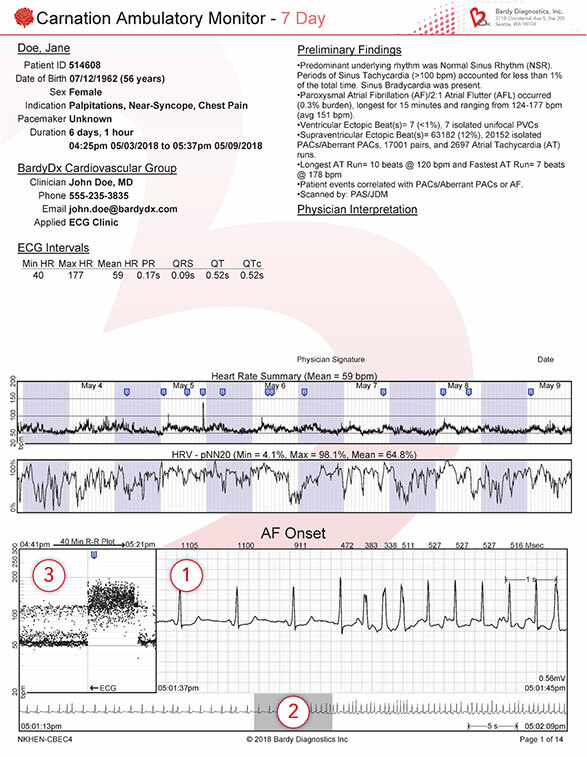 Every CAM report focuses on actionable ECG events rather than excessive statistical analysis. Superior signal quality, P-wave centric, and up to 7-day patient wear generate vital data needed to establish a diagnosis. CAM report is typically obtained within 2 business days from the time you directly upload data from the patient’s CAM patch to BDxCONNECT. Analyze data using your in-house technicians or elect to have reports prepared by BDx Solutions, our experienced team of certified ECG technicians. Receive an alert when reports are ready. CAM reports are provided in PDF format and available through BDxCONNECT. An 8-second traditional view with R-R measurements in milliseconds. A zoomed-out, 56-second snapshot displaying 24 seconds prior to and 24 seconds after an episode or event. A 40-minute R-R interval plot in bpm capturing 20 minutes prior to and 20 minutes after the episode or event to provide even greater context. Our Houston, TX-based team of CRAT- and CCT-certified ECG Technicians and Customer Service Managers analyze your data and prepare findings into a preliminary report that is typically ready within 2 business days. We provide multiple service models to conform to the needs of your practice.